Once again I had the honor and pleasure of examining items for the upcoming arms and armor auction at Fischer Auction House in Luzern, Switzerland. As always, there is never enough time to take all the measurements I would like, but I hope you find this information useful. Special thanks to the staff of Fischer, and especially Dr. Maeder for their wonderful hospitality. Thanks. What a great collection of weapon with good pictures. Where these really thrown in battle at people, or are they more like caltrops/krähenfuss?? Maybe thrown in battle before people to step on? The panzerstecher (armour-piercer) on page 3 is also really interesting. 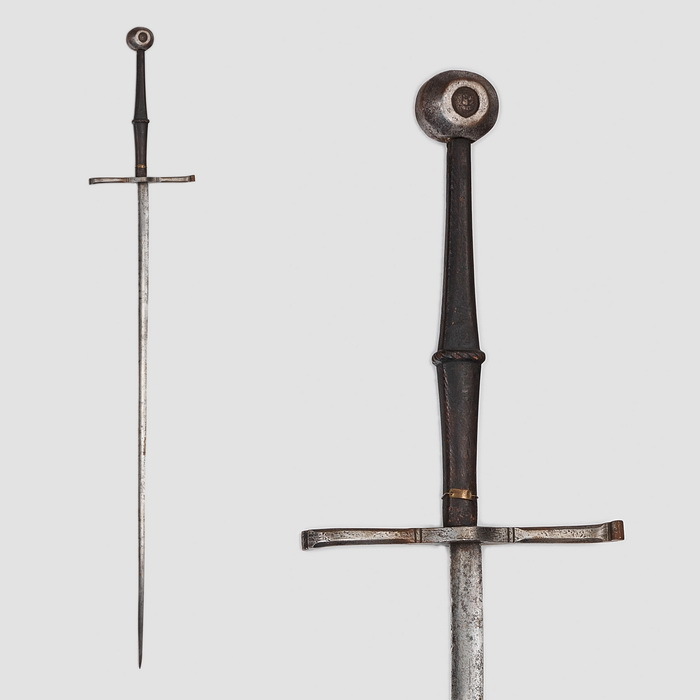 [the one you show as german estoc above] That's one insanely thin bladed 2-handed sword. Last on page 6 they also have a double headed Dane Axe seemingly intended for warfare, as the axe-blades look thin and are of different sizes. You don't see that very often. Danish army still uses SIG P-210 since 1949 (just called M/49 Neuhausen up here), so it really Swiss quality. 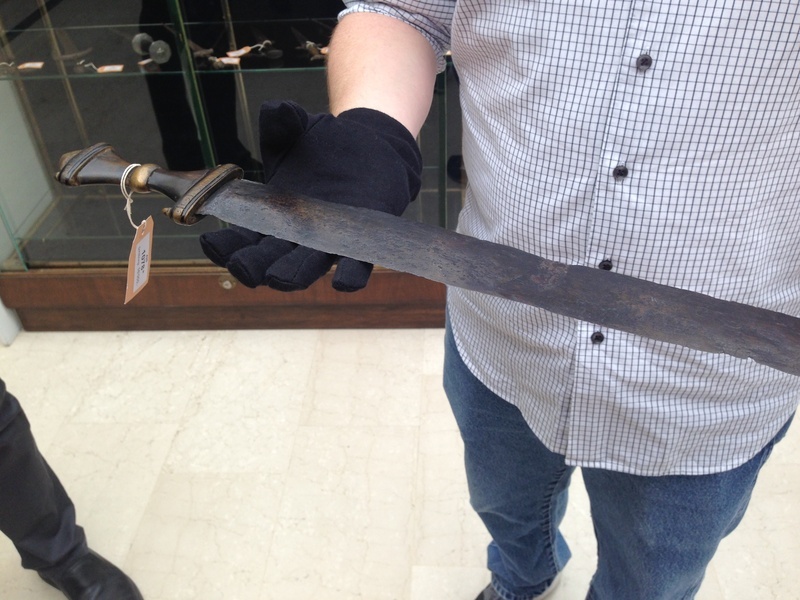 Is the spatha's hilt length given correctly? 3,5 cm is the width of approximately 2 fingers, maybe it was supposed to be 3,5 inches? 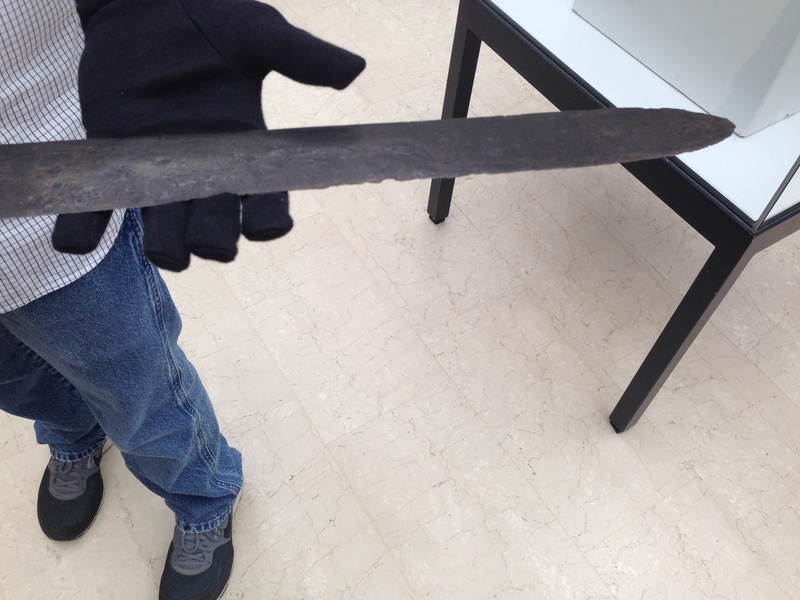 Overall length is 89.5cm, blade length is 77.2cm, so the hilt (whole, not just gripable area) is 12.3cm. That spatha, whether an original or older repro, calls to me. I've had little interest in that era, but if I ever had a piece made from that period, it would have to be based on this. Kinda looks like something our good friend Scott Roush might bring to life . It certainly looks like the River Scheldt find purportedly published in later editions of Oakeshottes "Archeology of Weapons." 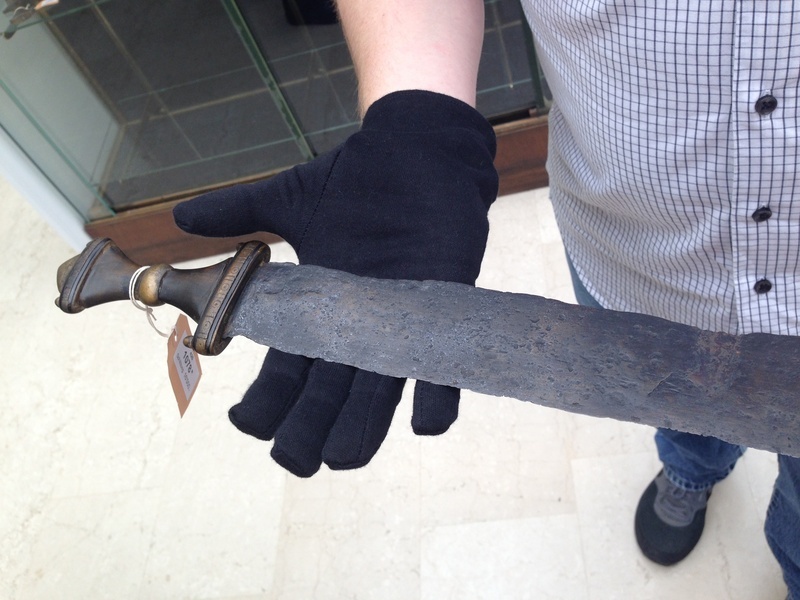 See: http://www.swordforum.com/forums/showthread.p...ilted-seax as posted by forumite Kirk Lee Spencer. 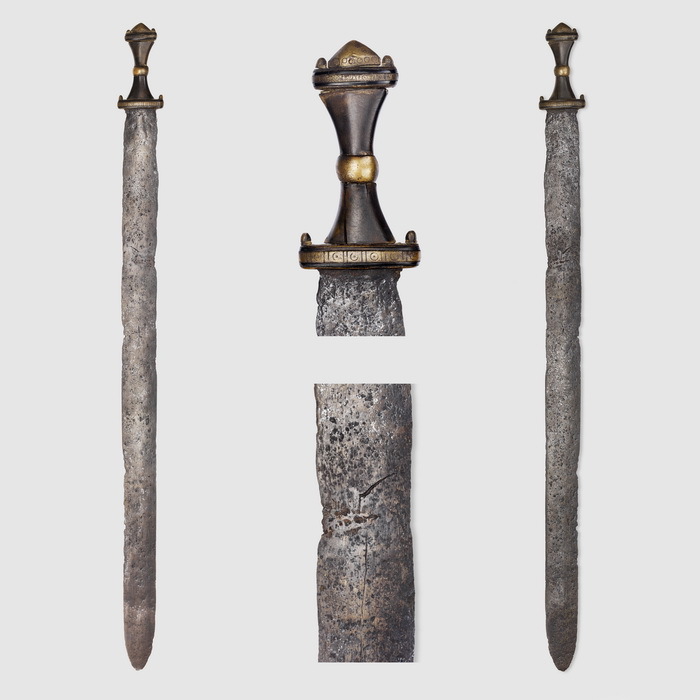 The spatha hilt is possibly original. It shows no signs of being tampered with (pins removed, etc). The horn on the grip was analyzed in a lab and although it couldn't be accurately dated, it was not a modern replacement. Great! That makes me a happy little collector. Does anyone have any more pictures of this spatha? Perhaps some close up shots, or one showing the end of the pommel? 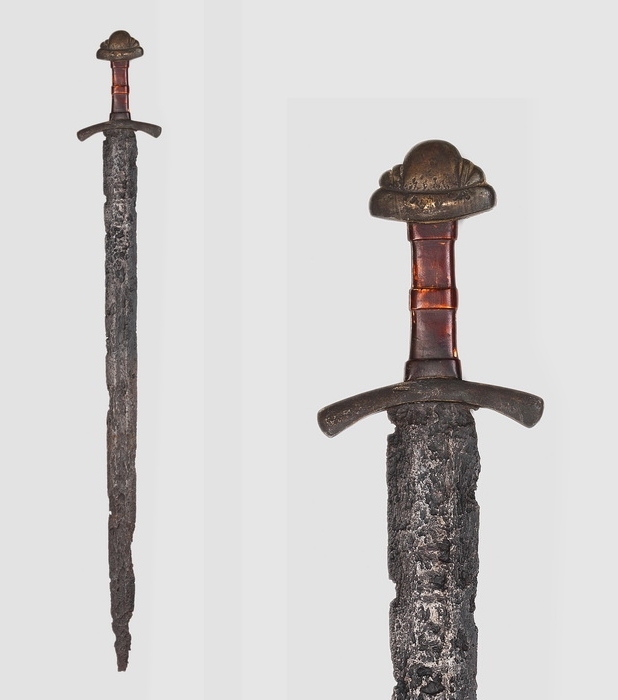 Also can anyone tell me what the materials the hilt is composed of? Significant marsh, or river find in exceptionally good condition. 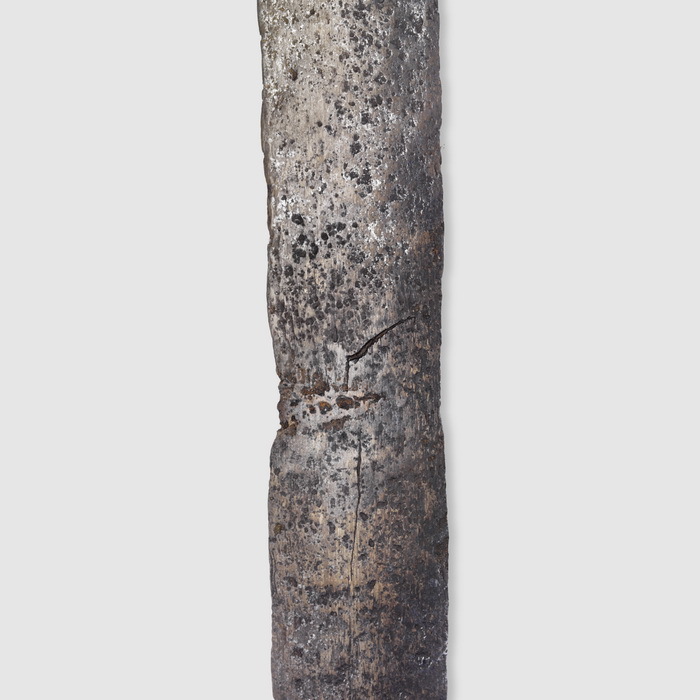 Vascular parts of bronze combined with cow horn. Knauf Crown in a rounded pyramid shape with circle decorative eyes on the collected baseline. Knauf beams from three oval bronze and two horn plates riveted together. 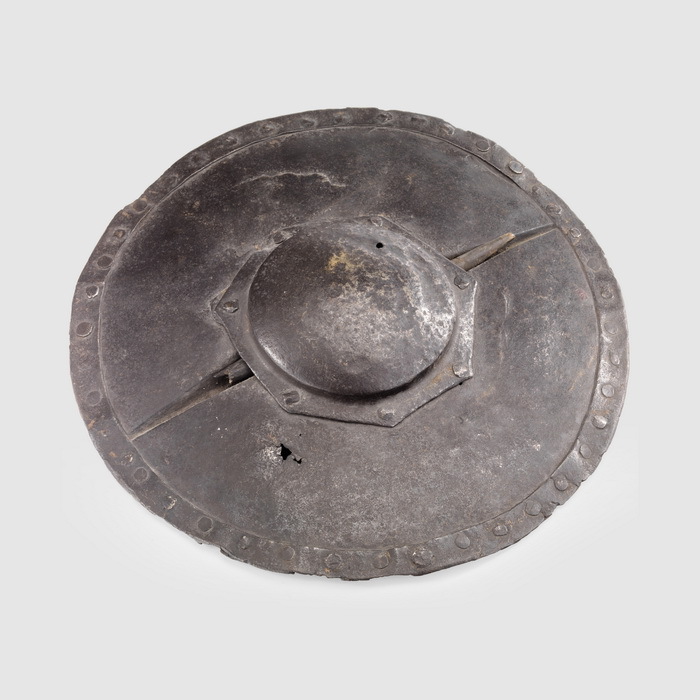 The Middle Bronze platelets as the identically structured guard (L 6.5 cm) decorated with 7 circular eyes between two vertical bars. 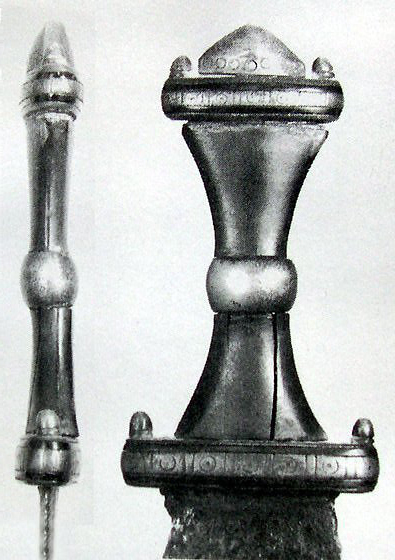 Grip of two flat-conical horn sleeves with a central knop bronze. Only thing I cleaned up was it originally said "river Fund". It's a shame they never give detailed view of mail items. The general form of 1246 looks Arabic, rather than German to me. 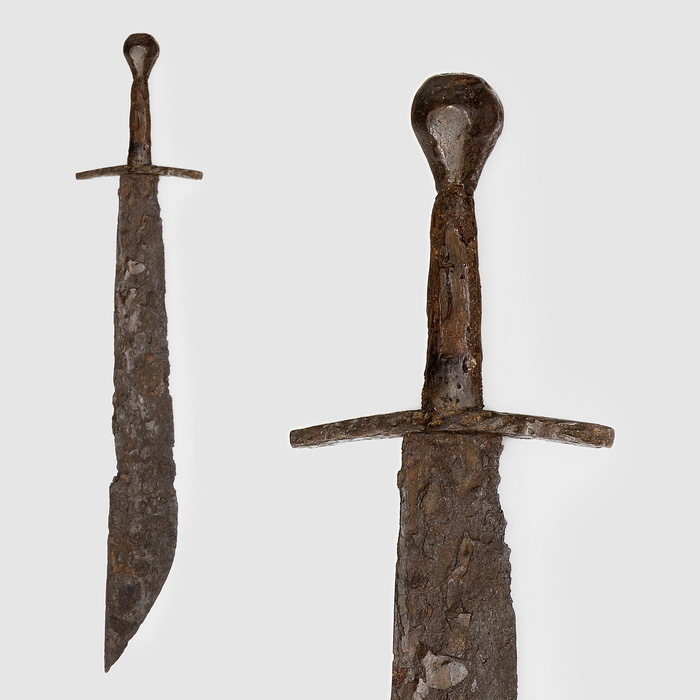 Fischer appears to be unaware of the publication and provenance... stating only that the sword is Anglo-Saxon from a German collection. It looks like this site is no longer extant. Did anyone happen to download the pix from this, especially for the Viking/Anglo Saxon and Spatha swords that were in Oakeshott's AOW? 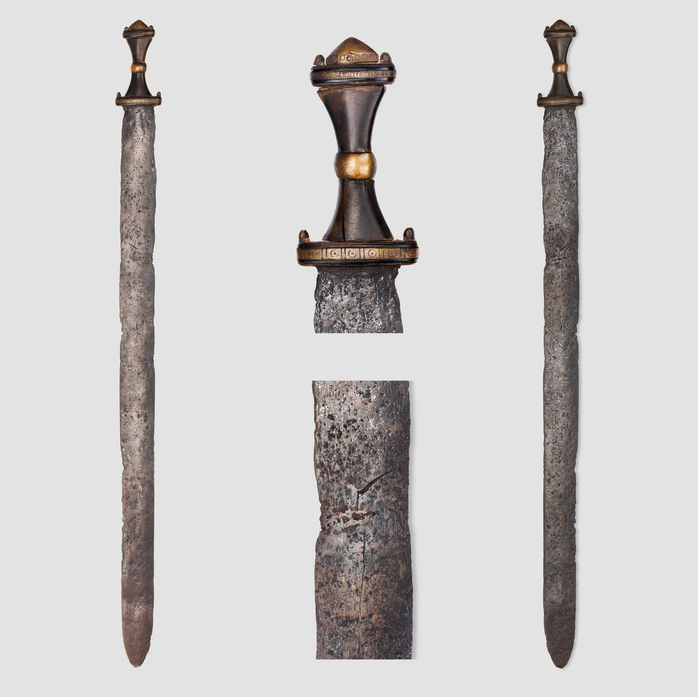 Also, did anyone download the description for the "Anglo Saxon" sword? The Fischer site no longer seems to have this, either. I have a few pictures, just send me your email. These are the pictures I've gathered of the spatha. There are a few more, but they will not load (even as "click on it to see it" attachments) due to size restrictions - they are all under 1MB, but likely do not fit the 1280x1024 frame limit. I'll play with them and see if I can get them loaded in a separate post. In other discussions, the direction of the lower guard pins has been discussed as being "wrong" and suggestive of a fake; other suggestions are that there was a "restoration" and reassemble at some point and the lower guard was put back backwards. I lean towards the latter, but have no hard evidence. Those that argue against the "put back upside down" theory often say that the pins are too big and it wouldn't fit a scabbard properly. I feel that those folks have never seen a scabbard with a notch or cut-out - something which is out there on later pieces, but many of these folks fall into the "absence of extant period evidence equals evidence of absence" camp versus the "we might not have found an exact match to this theory, but that doesn't mean it is not plausible and did not exist at the time - lot's of things get lost in 1,500 years". Good luck in finding data on the other items. 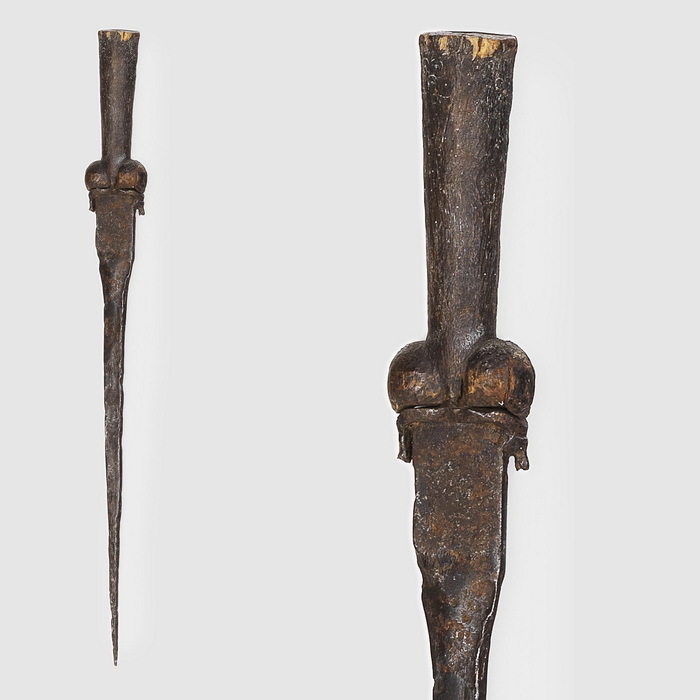 If you happen to run across more on this spatha that isn't in this thread, please post it back - I'd like to reproduce this some day and will take all of the data I can get. 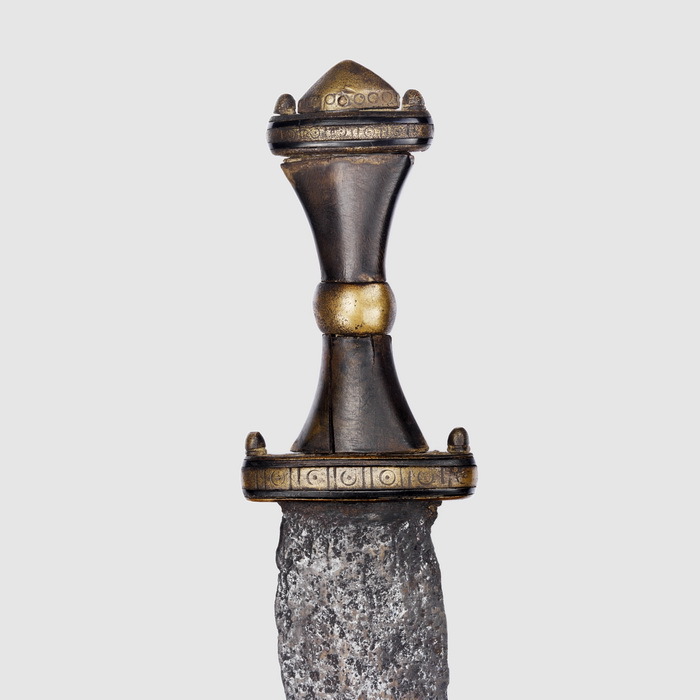 Close - color - hilt. More of spatha - reduced size to get to post. Still too big to open in the post, but didn't want to reduce so much that you'd lose all of the resolution. 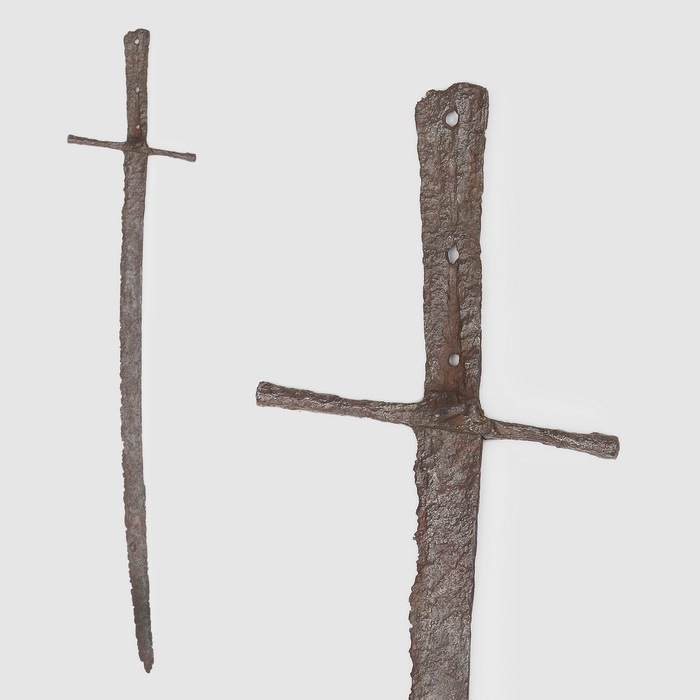 By the way, if anyone has details on the "Anglo-Saxon" sword, I could use them to guide my rework of an old Windlass "River Scheldt" sword I obtained recently. Specifically interested in what the grip material is (horn?) and dimensions.